PLAYA DEL CARMEN – Public transportation rates have increased for passengers traveling on local combis around Playa del Carmen and nearby areas. The new tariffs, which took effect July 15, have been set by Lázaro Cárdenas del Río and are said to be due to the increase in the cost of fuel. The announcement was made by Bruno López Herrera, manager of colective combis, who noted that current rates have been maintained for about 10 years. 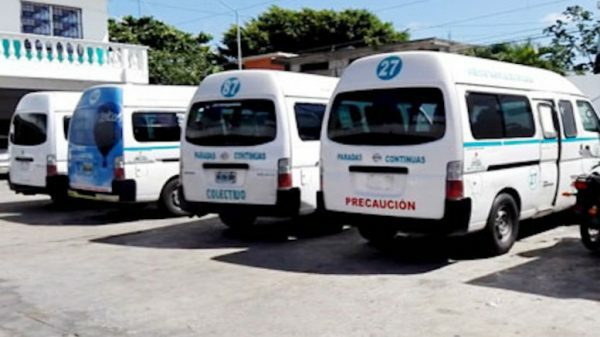 Previous fees for colectivo combis ranged from five to seven pesos for in and around Playa del Carmen and 12 pesos from Playa to Puerto Aventuras. Five peso routes will now be six pesos, while the seven peso routes will be nine pesos. Traveling from Playa del Carmen to Puerto Aventuras via combi will also increase from 12 to 17 pesos. Tariffs for the night route that operates from midnight until 2:00 a.m. will remain the same price of 10 peso and not will be part of the increase. The increases were authorized by the Ministry of Infrastructure and Transport (Sintra) back in 2014, but not applied. However, given the current situation with the price of fuel, the approved increases took effect July 15. Colectivo combis service 32 local routes with 163 units in and around Playa del Carmen. TUSCA public buses are not part of the Collective combis and are not part of the current price increase, but according to TUSCA transportation director Alejandro Salgado Sangri, will likely see a similar price increase around the end of September.